BURNABY, B.C. - First Nations vowed to stand in unity with protesters as police kept up arrests Friday in a Metro Vancouver conservation area where crews resumed survey work for the proposed Trans Mountain pipeline expansion. 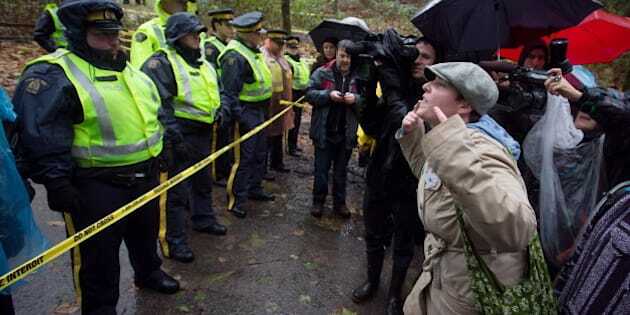 Shortly after activists announced they would do whatever it takes to stymie the project, a group began marching up Burnaby Mountain in the pouring rain. Charlene Aleck, a Tsleil-Waututh councillor, told a gathering of protesters at the base of the mountain that members of her First Nations band would join the actions aimed at protecting their homeland and waters. "For the Tsleil-Waututh nation, it is our sacred obligation," she said to a cheering crowd. "In our shared opposition to Kinder Morgan, we are many people paddling one canoe. Our united opposition and the sum of our collective voices will ensure this pipeline is never built." RCMP officers began enforcing an injunction order Thursday morning, four days after a court deadline passed for activists to vacate. In the days after the injunction was granted, protest barricades expanded as more supporters erected tents and voiced their opposition. RCMP Staff Sgt. Maj. John Buis said eight more arrests had been made Friday, adding to the 26 people arrested Thursday by Mounties in Burnaby, a suburb of Vancouver. Buis sent a message directly to protesters at a news conference Friday afternoon, saying police appreciate their co-operation to protest in a respectful and lawful manner. He said officers will continue to facilitate peaceful protest in the area. "As always, our long-term goal is to honour the protesters' rights to peacefully protest and to ensure public safety for those who wish to participate in a peaceful, lawful manner." An aboriginal sacred fire that had been in the "no-go" zone had been relocated, but Buis said three First Nations members were still behind police tape and they were negotiating with them to leave the area. Work crews that had stayed away from the mountain returned during overnight to remove tents and placards. Geotechnical work, approved by the National Energy Board, is required before any construction may begin. Kevin Washbrook, who was arrested Friday, said in an interview he had to be arrested to take a stand. "The federal processes, they've failed us," he said, referring to the National Energy Board hearing process that will assess the pipeline application. "It's kind of sad, but this is what it's come to right now. This is what politics is right now for people in B.C." Washbrook said unlike the violent arrests on Thursday, police were almost apologetic when they took him and others into custody. At an event in Calgary on Friday, Kinder Morgan Canada's president, Ian Anderson, told reporters the Burnaby Mountain passage is still the preferred route for the pipeline's expansion. He said delays by protesters won't force the company to ask the NEB for an extension to complete its survey work. "I think the RCMP has done an excellent job in securing the work site. We've got seven to 10 days of work we want to undertake and we want to respect the right of peaceful protest." Anderson said the company has the full support of its customers, shippers and investors in pushing ahead with the project. "They believe in the path we're on. It's unfortunate what's happening in Burnaby right now, but hopefully we can manage through it." The company said in a news release that it's employees would be drilling two, 250-metre-deep holes and would be setting up equipment, lights and fencing. Before Friday's arrests on Friday, Squamish Nation Chief Ian Campbell told a crowd of protesters that his nation doesn't consent to Canada issuing rights to third-party interests atop of their sovereignty and aboriginal rights and title. "We do not consent to Kinder Morgan's application for the wilful destruction to this beautiful part of our territory, the related tanker traffic that is being contemplated. We do not condone this behaviour in our territory." Opponents of the pipeline argue the expansion would increase the risk of a devastating spill because of the increased quantity of oil being transported through the pipeline. They are also concerned by the prospect of more tanker traffic in Vancouver's harbour. If approved, the expanded pipeline could ship almost 900,000 barrels a day of crude from Alberta to the B.C. coast.